There are a lot of great toys out there for kids, there's no denying that. There are games, puzzles, electronics, toys for outdoor play and ones for quiet imaginative play, things to play in the water or toys made to travel... it's really a good time to be a kid, isn't it? However, when it comes to quality, even though there are plastic toys that are fun and entertaining, it's the natural, well-crafted, simple toys that seem to spur my kids' imaginations, are completely safe, and last not only for the two of them, but for generations to come. Combine that with the fact that well-made wood or fabric toys are often the ones that encourage the inventiveness, creativity, and development of fine motor skills that are important during childhood and what more could you ask for? That's exactly what PlanToys and their collection of classic wood pieces and super green designs believe as well. For over 30 years, PlanToys has been recycling the wood from expired rubber wood trees to create beautiful wooden toys that inspire children's imaginations and promote a commitment to sustainable play. This is the only company to receive global recognition for their drive to contribute positively to the world, as they consistently develop their toys to cultivate creative minds while also encouraging children to grow up with the knowledge and appreciation to respect and preserve natural resources! So, as the holiday season is upon us and there are wishlists full of video games and plastic toys near and far, now was the perfect time for my children to see the wonder and simplicity of PlanToys' Monkey Bowling and Curvy Click Clack. Is there a cuter bowling set than these five funky monkey pins and monkey ball? I love the way that PlanToys included such cute details into these six pieces, from the sweet monkey faces and ears to the variety of minimal color to the overall smooth feel and quality. Each of these monkeys are weighty enough that the pins stand up easily and the ball rolls well, however, the entire set is so lightweight that a child (ages 3+) would have no problem carrying them, setting them up, and playing time and time again. Retailing for $25 (directly from PlanToys or on Amazon), Monkey Bowling would be a universally wonderful gift for any young child to experience the entertainment (as well as the cause-and-effect science, logic and motor skills) on their own or with friends. For even more eye-catching, unique, visual and sound fun, the Curvy Click Clack provides a colorful way for children (ages 3+) to watch and hear the balls rolling down the curvy tracks. The dimple details not only slow down the balls' descent, but they add to the calming, clickety clack sound that continually occurs from one level to the next. We did have to adjust the ramps a bit to make sure that the balls continued their momentum all the way to the bottom, but that only added a little extra suspense and mystery! I love that PlanToys included three large ball holders right on the base of the stand, so that children of any age can start and stop the enjoyment (while also enhancing their coordination, concentration, fine motor skills and more) on their own. Retailing for $45 (directly from PlanToys or on Amazon), Curvy Click Clack is a perfect example of how much fun kids can truly have with simple, gorgeous toys like these and I appreciate that PlanToys has something for every age, personality and ability that is sure to be a big hit. This holiday season, be sure to check out their huge array of items that will encourage children to role play, think critically or just explore imaginative possibilities. Their toys will be more than just a gift under the tree, they'll have the ability to help build social skills or individuality while enhancing a young child's ingenuity and understanding of the world. Find out more by visiting the PlanToys website and connecting with them on Facebook and Twitter, while finding great deals and products at the NEW PlanToys online store. Other than the Monkey Bowling and Curvy Click Clack that I was provided in order to facilitate my review, I was not compensated or enticed to do this post in any way. This review is solely my honest opinion of this company and their products. The toys are definitely well made and built to last with years of play for my grandkids. The monkeys are adorable and I also like that they have so many options and good deals. How cute! I love wooden toys they last the longest in my house. My favorite is the garage! The monkey toys are great. Good looking and meant for hours of play and learning. I love all of these different toys, especially the Curvy Click Clack. Everything seems so durable! Good company: For over 30 years, PlanToys has been recycling the wood from expired rubber wood trees to create beautiful wooden toys that inspire children's imaginations and promote a commitment to sustainable play. I really like the looks of that marble game! I want it! I follow in Pinterest! and will buy a fish tank and fish! 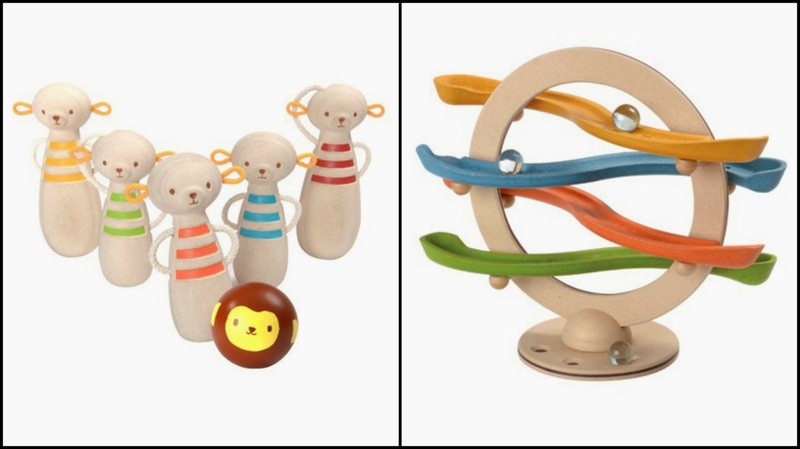 Yes these toys do look cute and sturdy as well, they will definitely last for generations. I like the garage with the elevator so you can put the cars on the different levels.